STP-8, Full-Range PA Speaker Cabinet from Grund Audio. Grund Audio adds to the ST Pro loudspeaker series the STP-8 full range speaker and the STP-5S subwoofer, both designed to work together. 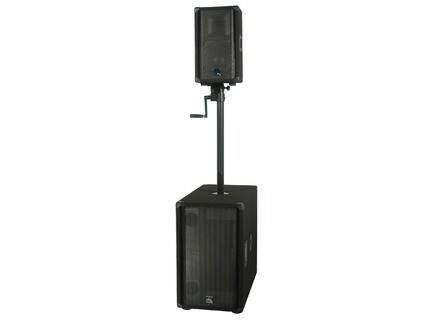 The STP-8 is a two-way passive loudspeaker that can handle 300W RMS (program) at 8 ohms. It hosts an 8" woofer and a 1" compression driver. The enclosure includes a pole cup for mounting and a pair of handles. The STP-8 will mount on the STP-5S subwoofer equipped with a 15" woofer, roller casters and a pair of handles. Together, the STP-8 and STP-5S provide a frequency range from 50Hz to 18kHz. Both enclosures are made of multiply pine wood and are manufactured in the United States. If you buy a complete system (two of each model plus mounting poles), you'll pay $2199 instead of $2446 (price of all units bought separately). You'll find more details soon on www.grundorf.com. Adamson introduces the Point Concentric speakers Adamson launched at ISE in Amsterdam the new Point Concentric passive loudspeaker series, which includes 5 compact models. Studiomaster combines Speakers and Lightning Studiomaster unveiled the new Starlight loudspeakers equipped with a lightning system. DAS Audio introduces the Aero 40A 3-way line array DAS Audio unveiled at NAMM the new Aero 40, a 3-way powered line array with DSP delivering up to 4000W.